Energy efficiency is becoming more and more important and is being enforced through policy and regulations. Consumers benefit from lower energy costs while the manufacturers benefit from insulation materials due to their increased demand. In our detailed market studies of the insulation industry in the most important regions worldwide, e.g. thermal insulation systems or insulation systems, techzone insulation or insulation materials, we show the growth potential of individual country markets and product groups, application areas, customer segments and business segments. The studies are based on information from the most important manufacturers of the industry, which are obtained via telephone interviews and questionnaires. In return, cooperative companies get parts of the study for free, thus a high recovery rate can be guaranteed. This way, you get real figures about the different markets for the insulation industry and market shares of the top manufacturers. Our tailor-made forecast models deliver reliable forecasts for the coming 3 years. Especially with facade connections of cantilevered components, or reinforcements, it comes directly to a weak point in terms of the thermal insulation of buildings. However, thermal bridges that arise can be minimized by thermal separation. For example, load-bearing thermal insulation elements help to construct cantilevered and supported reinforced concrete and steel balconies as well as balustrades and attics with a higher energy standard. In some cases, tension rods made of glass fiber reinforced plastic (GRP) are used (instead of steel or stainless steel, for example). Companies that are active in this area are u.a. “Schöck”, as well as “AVI”, H-Bau technology, etc. More information about our planned study in this area will follow shortly. 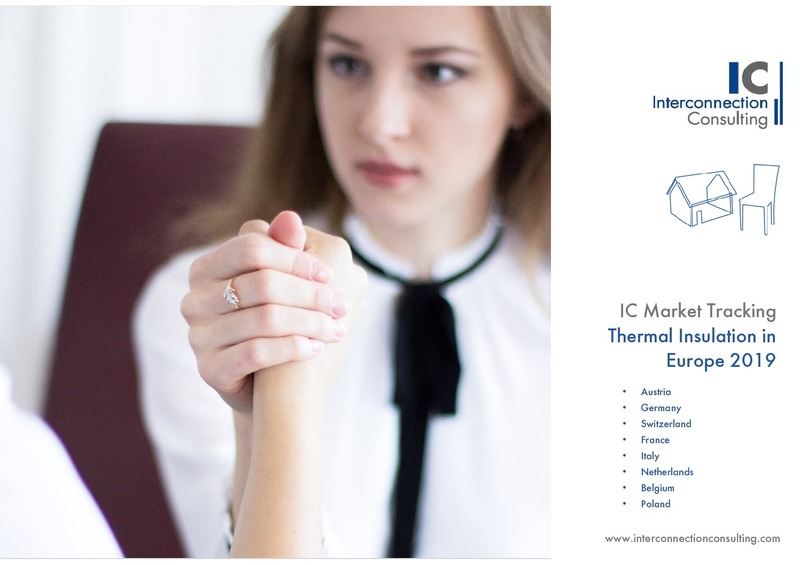 With sales of over € 10.1 billion and a sales volume of just under 184 million cubic meters, the market for insulating materials in Europe rose by 5.2% in volume and 9.4% in value in 2017. 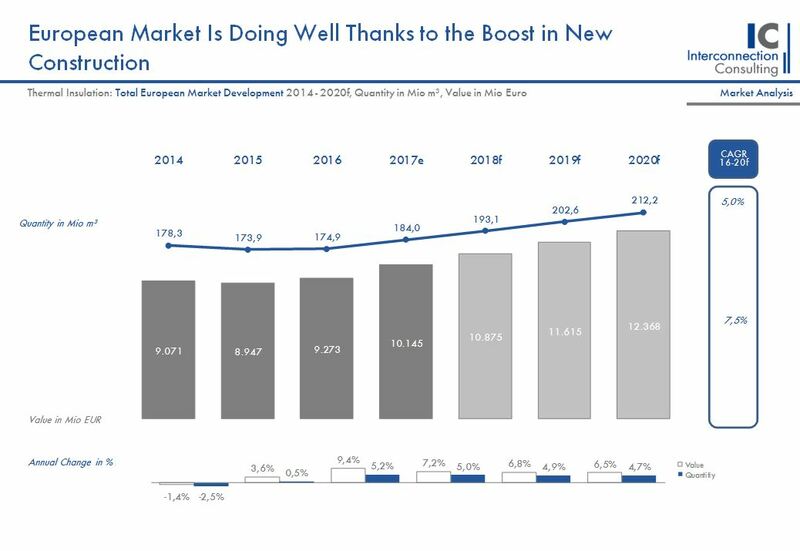 By 2020, the market in the 11 European countries under review will increase by an average of 7.5% per year in value, according to a new study by Interconnection Consulting. Turkey is the largest market for insulating materials in terms of turnover with a volume of 1.93 billion euros. In addition, with average growth of 11.8% per year by 2020, Turkey also has the largest growth of all 11 markets examined. Poland scored the second largest growth with an increase of 10.3% per year in value. The rapid increase in Poland can be explained above all by the construction boom. In 2017, construction completions rose by 17.2% compared to the previous year. The largest sales market among the 11 analyzed markets is Russia with a volume of 44.4 billion cubic meters. Insulating materials made of EPS (expanded polystyrene or styrofoam) play a dominant role in Eastern Europe and also in Poland. In Poland, the EPS ratio was 40.5%. “The low cost of EPS makes it difficult to establish new methods of thermal insulation, especially in Eastern Europe”, explains Veronika Hudakova. 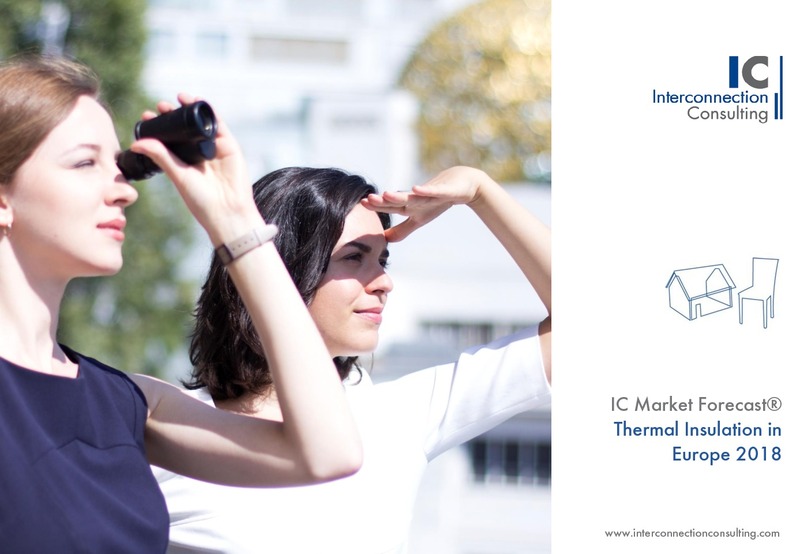 In contrast, the share of EPS in the Western European markets decreases significantly, because there are major concerns over the flammability of the material. Polyurethane insulating materials had to contend with declines in 2017 due to the shortage of raw materials. In Austria, the decline was -1.9%. The largest area of application are the outer walls with a share of 35.9%. Just behind it are roofs with 34.1%. 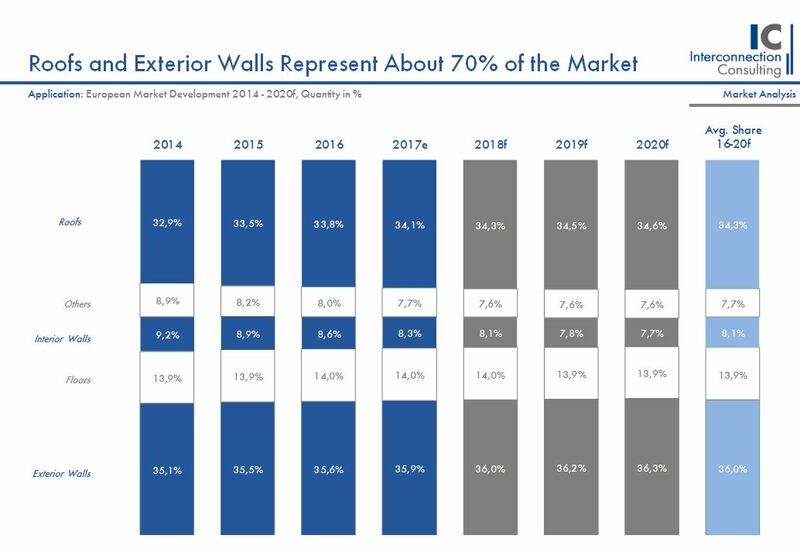 By contrast, indoor walls are experiencing a sharp decline in terms of market shares. From 2014 to 2020, this area will shrink from 9.2% to 7.7%. On the other hand, the floors remain constant with a share of around 14 percent. The top 5 companies had a market share of 38.5% in 2017. The top 10 companies are in alphabetical order: Austrotherm, Caparol, Isover, Kingspan, Knauf, Paroc, Rockwool, Swisspor, Technonikol and Ursa. The study examined the markets in: Austria, Switzerland, France, Italy, the Netherlands, Belgium, Poland, Russia, the Czech Republic, Turkey and the United Kingdom.